Everything but the kitchen sink was thrown at us today but we’re still standing. I began the morning patching up yesterday’s slow puncture. 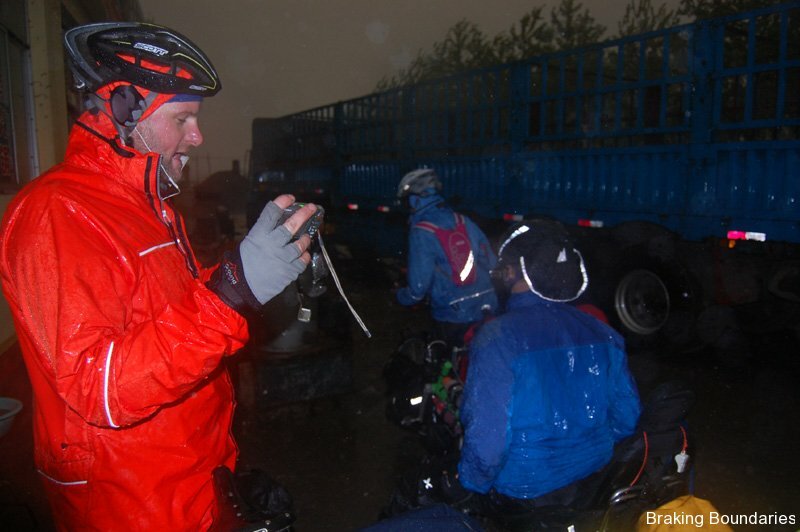 Everyone was taking their time as the weather looked unfavorable. Just as we were about to set off, David noticed a trickle running from Katie’s hydraulic brakes. Cue much tinkering as we bled and refilled the leaking tube. We finally got on the road at ten, setting the tone for the day. Stop-start-stop. After a brief sun-shower, the weather began to clear and by mid-morning we were bathed in warm, glorious sunshine. Things were looking up. And then they weren’t…. Around 12, we were forced to stop due to another flat. I’d apparently missed the cause of yesterday’s puncture, thereby ensuring a re-run, though thankfully under sunny skies this time. In the bright light of day, David quickly found the culprit, a minute shard of metal less than a centimeter long. Around 3:30pm, still only around the 55km mark, a loud bang announced yet another flat, this time on Jared’s bike. I initially mistook the bang for a firecracker or car backfiring. 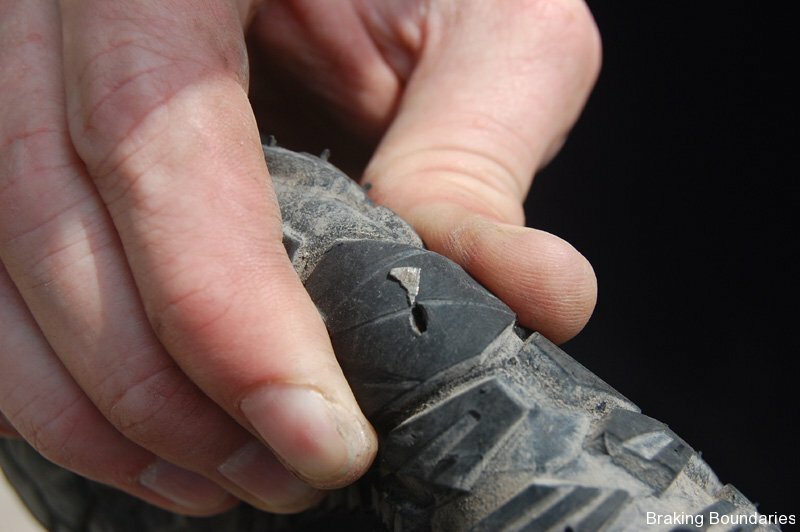 Never one for half measures, a little old slow puncture would not suffice for our Kiwi colleague. His tube blew spontaneously and rather spectacularly, shredding itself into ribbon. By now, we were well- versed in changing tires and fixed it with a rapidity that would have been the pride of any F-1 team. Even so, we did not escape the attentions of some local gawpers. Our savior was a little middle-aged restaurant owner who beckoned us from the sanctuary of her doorway. She gave us complementary Cokes and refused to accept any offer of payment, only asking for a copy of the photos we took with her. Surprisingly, this was easier than anticipated – she had an old PC in the back room. It gave Jared a few zaps, though I’m inclined to blame this on his sodden state rather than dodgy electrics. The lady’s kind generosity was a nice counterpoint to the catalog of calamities, and it really lifted our sagging spirits. Still, as the song says, you gotta know when to hold ’em and when to fold ’em. 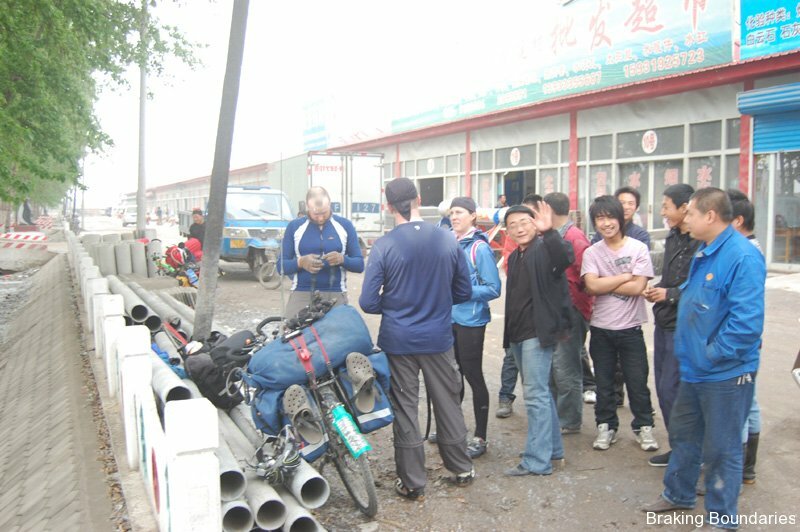 With over 150km to Beijing and the light of day fading, we decided to cut our losses. Pausing for half an hour for the worst of the storm had passed by (the weather fronts were fast moving all day) we headed back to the nearest town and found a cheap motel/sauna to crash at for the night. A final thought: The old Chinese proverb “May you live in interesting times” was actually a curse, not a wish for good fortune.